Today is the first day of August, and this is also the first month of Ramadhan for all moeslim around the world. Actually I am moeslim too just wanna say Happy Fasting to all moeslim. Well since this is already August, I think the released of toys and figures in this month must be the most awaited thing for all of you. Well I can't blame that many good things will be released on this month, but it doesn't affected on me since I've order nothing LOL. This time Toys and Hobby presented a simple review about Colossus X-Men Danger Room Fine Art from Kotobukiya. You can see more of Colossus statue here : Colossus Comiquette. The Tough steel-skinned mutant, Colossus is brought to you into the statue from The amazing X-Men Danger Room Sessions Fine Art Statue series. He was born as Piotr "Peter" Rasputin who grew up on a striving farm in the Soviet Union. He first released his true abilities when a tractor almost hit his sister. 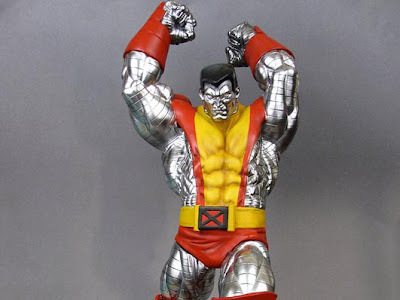 Changing into a living steel form with large strength and endurance, Colossus who always practicing in the Danger Room would join the X-Men and serve with variation. The X teams have trained together in the Danger Room, the ultra high tech facility room which equipped with variation training that challenge each mutant in unique ways. Colossus is a massive and unstoppable force Inspired by Jim Lee's 1990's era X-Men. The massive mutant who can bring down his rough fists to destroy the last of his broken enemies. The Colossus X-Men Danger Room Fine Art showing off each muscle wrapped in fine, tight bands. With his classic bright red and yellow costume which decorated at the waist with a large red and black "X" logo. All of his skin is exposed with bright metallic silver, except for his black hair. This statue comes with two interchangeable heads: the first is angry yet focused, while the second is a sheer mask of rage! 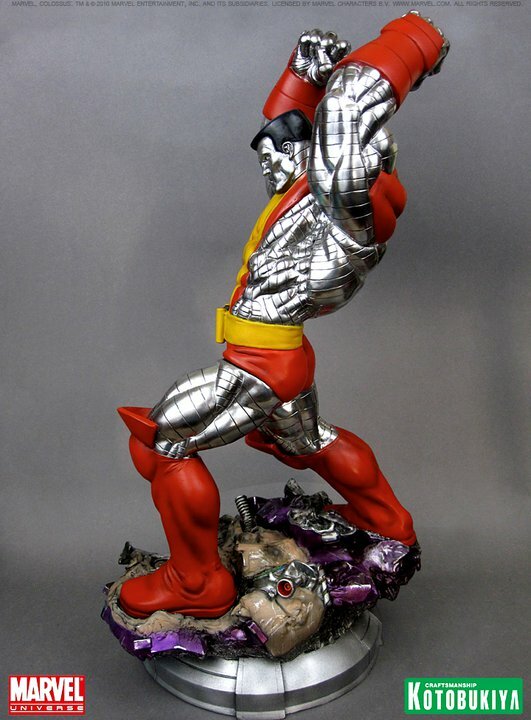 Sculpted by Erick Sosa, the Colossus X-Men Danger Room Fine Art stands approximately 15 inches tall! He's indeed in scale (1/6th) with the other Danger Room Sessions participants. All of them stands upon a unique Danger Room holographic environment with translucent parts glowing with a built-in LED light in the base. In Colossus' case it's the shattered remains of a torn up Sentinel robot. 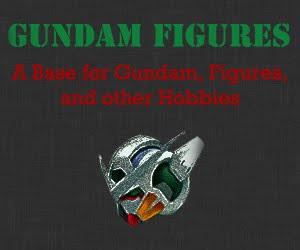 This is the perfect figure to collect, just watch carefully and grab your own. 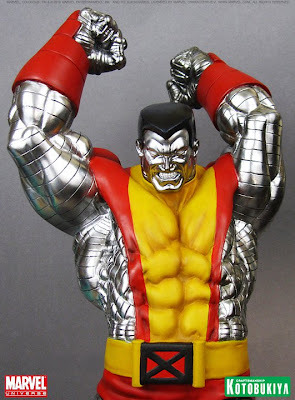 Colossus is a cool X-Men who is able to remain cool-headed for a big guy in steel. Kotobukiya new line of x-men figures nvr fails to impress! Hello from Indonesia, nice to meet you. Feel free to Contact Me if something good happened.